Home » Top Must Reads » Understanding castle doctrine and duty to retreat. Understanding castle doctrine and duty to retreat. In society’s terms, it’s called “fight or flight.” In the courtroom, it’s discussed as Duty to Retreat or Castle Doctrine. In reality, it is knowing when to use deadly force in a situation or when not to. The lines aren’t always clear, but it is important to know the laws and how to train for these scenarios. For today’s topic, we won’t get into the situational aspects that always need to be factored, such as how much collateral damage could the proposed deadly force do? Instead, we will consider the first moment when assessing a situation in which we decide if we are legally obligated to “retreat” or if we can apply castle doctrine (or stand-your-ground, as explained shortly). Castle doctrine, also termed castle law or defense of habitation law, is a legal doctrine applicable in 46 U.S. states that designates a person’s house, or in some states any legally occupied place (i.e. vehicle or workplace), as carrying protections and immunity against persecution to use force, up to deadly force, to defend against an intruder. Where castle doctrine gets even more tangled is the subjective requirement of fear. Can one claim immunity with castle doctrine on the basis of trespassing alone, or does one have to objectively prove that the intent in the intruder’s mind is to commit violence against the defender? Cases where this has been shown to be controversial include the deaths of Scottish businessman, Andres de Vries, and Japanese exchange student, Yoshihiro Hattori, the latter whom died in 1992 in Baton Rouge, Louisiana, when he went to the wrong house, accidently, trying to get to a Halloween party. He was unarmed and shot point-blank in a driveway. The property owner was subsequently acquitted in the state court of Louisiana. To add an additional layer to castle doctrine, some states include a stand-your-ground law, in which one can use deadly force in any location one is legally allowed to be, without requiring an attempt to retreat, to defend against a threat, even outside one’s own home. 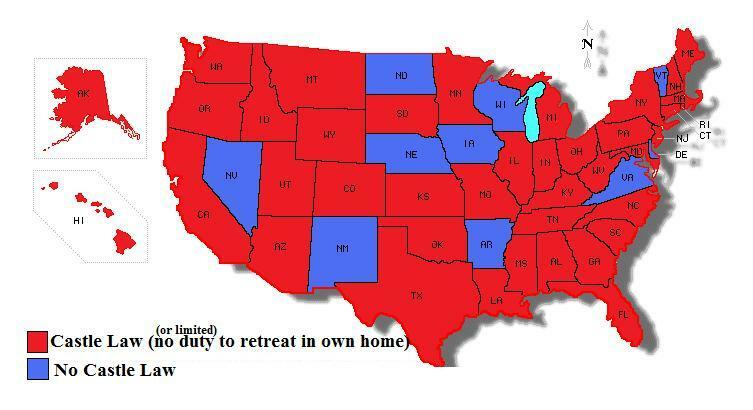 In fact, 22 of the 46 states that have a castle doctrine removed the “duty to retreat” requirements from locations outside a person’s home. Interestingly, economist John Lott found that in the states that have adopted stand-your-ground/castle doctrine-based laws, murder rates were reduced by nine percent and overall violent crime was reduced by 11 percent. Now jump to the other side of the situation, when you have to determine whether you have a “duty to retreat.” This is a specific component that often appears in defense of self-defense. For jurisdictions that require a duty to retreat, the burden of proof is on the defendant to show that he first attempted to avoid conflict and, furthermore, took reasonable steps to retreat or displayed an intention not to fight before using force. When, then, can one use force where the lines of “duty to retreat” and “stand-your-ground” intersect? The question is slightly rhetorical, as it is imperative that one knows the laws and principles in one’s own state. However, we can learn from how police are trained to detect situations that require deadly force and apply some of the same principles. By following the above steps, it is less likely that fear will cloud judgment where deadly force is warranted. For officers in training, they have to make split-second decisions to assess threats. In fact, they train for a “half-second” response to use deadly force. Studies have literally measured this out, citing it takes .25 seconds for an officer to recognize a threat, such as when a person is reaching for a gun, and another .25 seconds for that officer to draw his gun. Then it takes another .06 seconds to pull the trigger. What they practice learning is all about the hands. It’s the hands of an intruder or suspect that will hurt or kill them or others. If someone is reaching for a gun, the officer has to start making a choice. There is logic behind this. Body language is hard to decipher. Mind-reading is out. But using the above progression of “reasonable fear,” knowing your local laws, and watching people’s hands will help you know when to retreat and when to draw. State’s with Castle Doctrine, and the text of each law, via Wikipedia. “Stand Your Ground” Policy Summary. Worst Case Scenario “Deadly Force” by Tracy Barnhart.